What is stock screener website? How it will help you? A stock screener is tool used for fundamental analysis of the stock. I have already discussed about How to do Fundamental Analysis of the stock? In this post, I will share information about 5 Stock Screener websites. Stock screener tool will help you in doing analysis and research. On Screener tool, you can filter stocks based on key parameters and metrics such as stock price, market cap, dividend yield and many more parameters. These stock screener website will surely help you in doing Fundamental Analysis of the stock. You may be surprised to note that Google is also providing Stock Screener Facility. The key features of Google Screener are given below. Google Stock Screener facility is free to use. 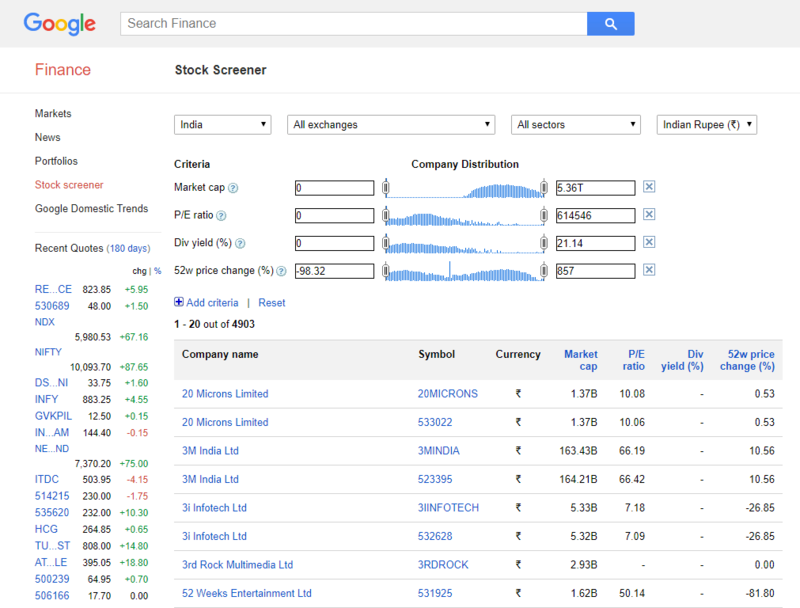 Google Screener gives facility to compare the stock with peer stock along with parameters. You can export data given on Google Screener. It provides coverage to both BSE and NSE. You also have criteria option to choose your own criteria of stock screening. After logging to Google Stock Screener website, you need to input company name in the search query and press search button, you will be taken to a page where you can find all parameter and interactive price movement chart. You can also compare the stock with peer stocks in terms of various parameters such as EPS, PE ratio, market cap, price to book ratio, dividend yield etc. You can also create a portfolio by clicking on Add to portfolio button. 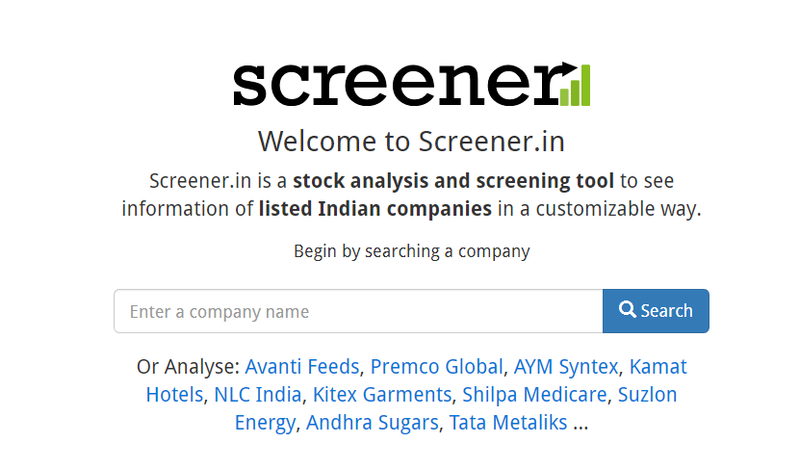 The Screener is a stock analysis and screening tool to see information of listed Indian companies in a customizable way. The key features and facility provided by Screener.in are given below. A Screener is a free tool for analysis. You can create your own watch list. You can even customize your screen. You can get a readymade quarterly comparison of last 12 quarters. Screener provides Exhaustive comparison of an annual result. This website also gives peer comparison. Analysis section of this website gives a brief analysis. It helps investors in taking an informed decision. On screener website, you need to input company name in the search query. You will be taken to the page showing charts along with complete information about the stock. It is also possible to export this data provided you have registered with the website. Registration on this website is free. Investing.com is third stock screener website. Investing screener is also free. The features and facility provided by Investing tool are given below. This website offers sector wise and exchange wise option. You can have watchlist and alert mechanism for a specific stock. You can have customized screen option in this tool. In the stock screener section, you need to select a country, exchange, and sector. On the selection screener will display results. You can get various readymade tabs like Fundamental, Technical and performance analysis. As per me, it is a fantastic website for stock analysis. Moneyqorks4me is paid stock screener tool. It gives a complete in-depth analysis of the stock. The key features of this tool are given below. Among all section of Moneyworks4me, I like 10 year X- Ray. It is a free feature. In this, you can find last 10-year financial report in a user-friendly format. It gives red, green and yellow indication about the stock. A sample report for Avanti Feed stock is given below. It is unique scanner compare to other. They have their own set of calculations and historical comparison by which they rate stock. They also have a unique concept of stock price calculator and MRP of stock. However, it falls under the advance facility and you need to pay money for using this facility. GuruFocus is the last screener in the list. GuruFocus is also paid tool. It does complex analysis and claimed to be a very good tool. The facility and feature provided by GuruFocus is given below. This screener covers almost all fundamental points. This tool also has option which includes sophisticated filter and calculations. I have not used this tool anytime for doing an analysis. A screener is must tool if you are buying a stock after doing the analysis. All free screener tool gives very good facility for analyzing a stock. However, in the free screener, you need to perform analysis on your own. A paid tool moneyworks4me and Guru Focus gives readymade analysis/report. However, it comes with money. If you are part-time investor I would recommend using a free tool such as screener.in. « MCX Gold Option – How it works?